Based in Kigali, Rwanda, As the Rwanda Country Director, Rosine leads Indego Africa’s in-country strategy and operations. 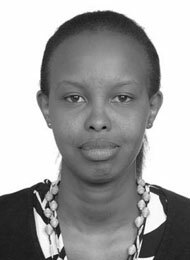 Prior to joining Indego Africa, she held positions as an Assistant Prosecutor for the High Court of Huye in Rwanda and as an Officer of Civil Status in Kigali. Rosine received her Bachelor’s Degree in Law (L.L.B) from Kigali Independent University, studied and wrote a master’s thesis at the International Humanitarian Law and Human Rights Universite de Geneve and received her Master’s Degree (M.A.) in Servant Leadership from Viterbo University in 2011. Indego Africa is a nonprofit social enterprise that identifies, trains, and empowers artisan women in Rwanda. Our mission is to help Rwandan women escape from poverty and improve their lives through access to employment opportunities and education. To achieve this mission, we provide female artisan cooperatives in Rwanda with access to the international market. We design and sell products that the artisans make by hand and pay them fair-trade wages for their work. We then pool 100% of the profits from sales, with grants and donations, to run business, leadership, and technology training for the artisans who make our products, as well as vocational training for young women in their communities. To illustrate how we operate, I will share the story of our artisan partner, Josepha. I first met Josepha in October 2015 when she came to our office to meet with our Production Manager, who is in charge of identifying promising artisan cooperatives, placing orders, conducting quality control, and preparing and shipping products for export to the U.S. When I talked to Josepha, she had already been identified as a woman with unique weaving skills that our other partner cooperatives did not have. However, despite her remarkable talent, Josepha was struggling to make ends meet. She would travel for hours to visit Indego Africa partners co-ops and try to sell her products. One day, our Production Manager, while visiting an artisan cooperative, noticed a beautiful basket that Josepha had made. She spoke with Josepha and asked her to make some sample baskets. Josepha, a committed, resilient and hard working woman, would make these products and bring them to our office. After successfully making a couple of samples, I told Josepha that if she wanted a long-term partnership with Indego Africa, she would need to create her own cooperative. So, she set out to start one. Josepha found nine other women, mostly farmers, who were working for less than $1 a day. She persuaded them to join her cooperative and work with her as weavers. They did, and today, Josepha’s cooperative is fully registered and providing life-changing income for all of its members. But that’s not all there is to know about Josepha. Josepha will tell you that she learned weaving when she was a child and always loved it. This love of weaving began at first as jealousy of her older sister, who could afford nice clothes because she was a weaver. Later, Josepha enrolled in a vocational training center and learned to love weaving as an art-form. But despite her talent and training, she struggled to support herself and her seven children. Now, after a year partnering with Indego Africa, Josepha has been able to put one of her sons in a technical school, where he is studying mechanics; buy more land for her farm; and pay people to farm for her while she is busy making Indego’s orders—providing income generating opportunities for others in her community. While Josepha’s commitment, love of weaving and hard work have paid off in many ways, she still needs more support. After a year of working with Indego, she has not been able to record any of the cooperative’s revenue or expenses, because she has no knowledge of bookkeeping, budgeting, or inventory management. Further, demand for her products is growing, and Josepha needs more members in order to keep up. To help Josepha increase her production capacity, and learn business skills, we are undertaking several initiatives. First, we are partnering with Josepha’s cooperative to identify young girls (high school graduates) in her community who are interested in participating in Indego Africa’s Vocational Training program to learn craft-making and business skills. These young women will receive technical training and mentorship from Josepha and her co-workers, so that they can join the cooperative. The young women will also participate in Indego Africa’s Basic Business Training program, where they will acquire the skills that the cooperative needs to grow as a business. This will help both the young women in need of jobs, as well as Josepha’s cooperative, by providing an influx of skilled new young members. Second, Josepha and her co-workers will have the opportunity to participate in Indego Africa’s Basic Business Training program and, in the future, may be eligible to enroll in our Leadership Academy—an advanced business training program. 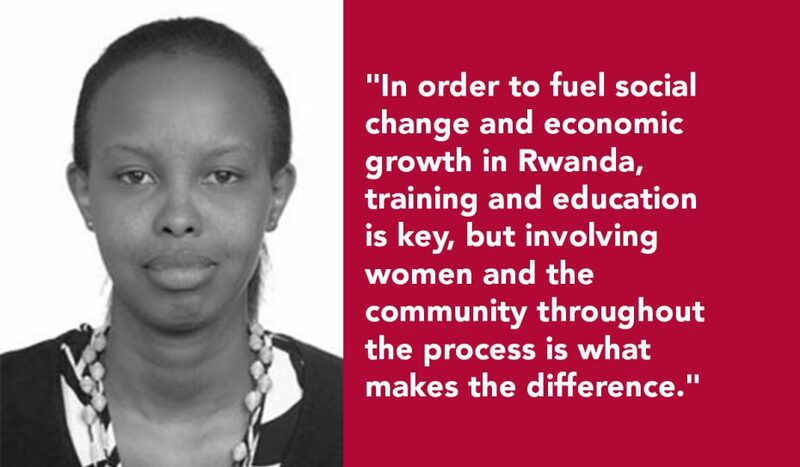 In order to fuel social change and economic growth in Rwanda, training and education is key, but involving women and the community throughout the process is what makes the difference. Giving women opportunities and ownership of decisions helps ensure that our programs make a sustainable impact in the lives of our partners. Finally, our programs help vulnerable artisan women to open their minds, learn new skills, build knowledge, and take advantage of opportunities that they would not be able to access otherwise.